By now I'm sure a lot of you have heard of Jewel Mint, Style Mint, Beach Mint, Shoe Mint, so on and so forth Mint. Yeah there are a heck of a lot of them. Each of them partner up with a different celebrity. At the top of my head I know that Jewel Mint is with Kate Bosworth, Style Mint is with the Olsen Twins, Shoe Mint is with Rachel Bilson, and Home Mint is with Justin Timerberlake. So from my understanding it is a monthly subscription with an option of skipping. However, rather than sending you a product under your style profile, they send you a bunch of recommendations and put it into your "Show Room". Each month they charge you $29 and that would give you a credit to redeem for a piece of jewelry. If you need to skip, you do so by the 5th of the month. The value of the jewelry pieces range from $30 to $100+, so it's definitely a good deal if you look at it that way. For Canadian subscribers, for every product that you purchase you need to add $9.99 shipping, which isn't too bad. I believe all the other Mint websites work in a similar fashion just with a different subscription price. I have never purchased a lot of jewelry for myself. Most of them are usually gifts from family and friends. Maybe because of the pieces that I really want are usually out of my budget. Quality over quantity right? Also, I've learned from an early age to control impulsive purchases so that rarely happens and I learned to become a "frugalista". Anyways I heard about this program last year but just never got around to subscribing because I was still student on a tight budget or unemployed. But now that I'm earning my own money, I still want to try make the biggest bang for my buck. When I saw the pair of earrings that I wanted go up for sale, I knew I had to get it! I am on a roll! I think this is my 4th nail art post this month? Virtual high five to everyone! Toronto International Film Festival has been over for a while. But while it was still going on, I collected a bunch of images of celebrities with gorgeous gowns and put them in my nail art inspiration folder. This is my second TIFF dress inspired nail art. My first one was Kristen Stewart's Zuhair Murad dress, so if you want to check it click HERE. When I saw a picture of Emma Watson at the red carpet for Perks of Being a Wall Flower at TIFF, I knew her dress was something I was capable of replicating. With a little help of Google, I found out her dress was part of Erdem Resort 2013 Collection. I was in love with the entire collection as soon as I laid eyes on it. The mix prints, florals and lace, it was absolutely gorgeous! Anyways below is my interpretation of her dress! It's a simplified version, but I really like how this turned out. Versus is subsidiary line under the Versace label. It was a gift to Donnatella Versace by her brother, Gianni Versace. 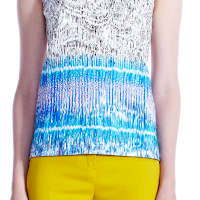 Since Donnatella designs for the main Versace line, she brought on Christopher Kane in 2009 to design for Versus. 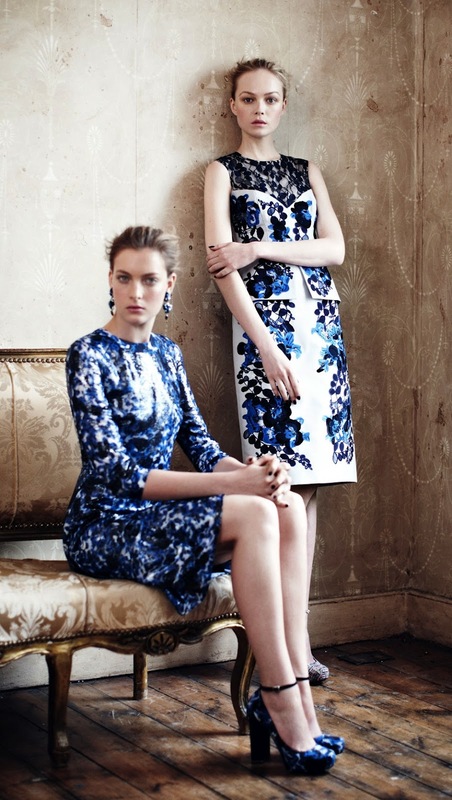 This collection actually made their debut yesterday in Milan during their Milan Fashion week. 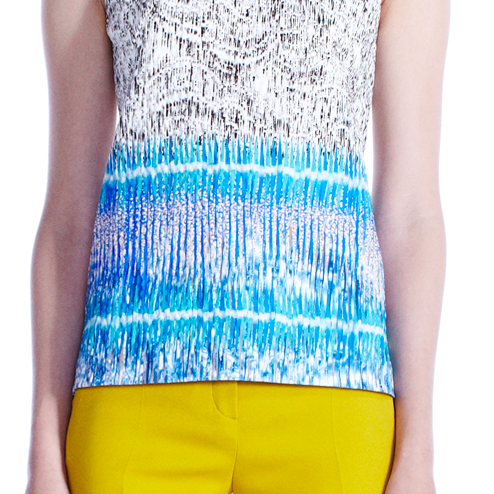 Like the title states, the inspiration for this design came from Versus Spring/Summer 2013 line. 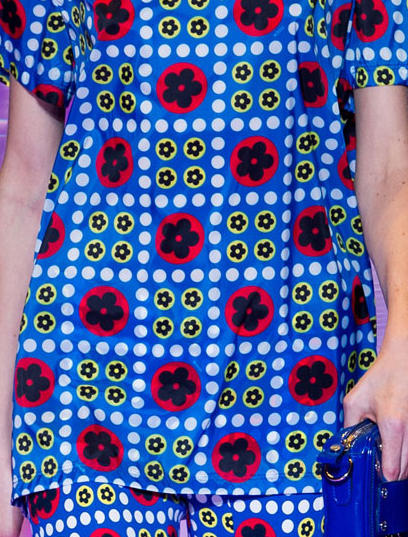 Bold colours and primary colours were the most prevalent in the entire collection. If you enjoy looking through runway pictures, Vogue UK is the best site to view it! Anyways this is one of the more simpler nail art that I've done and it's very easy to replicate. 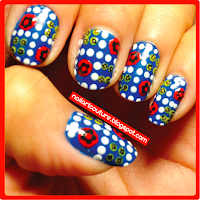 Nail art with a dotter is always fun and fast to do! Please keep reading for materials and tutorial! I am such a terrible blogger, it's honestly so hard to find the time. I come home from work, all I want to do is lay in bed. But I somehow I manage to gather up some strength to go to the gym. 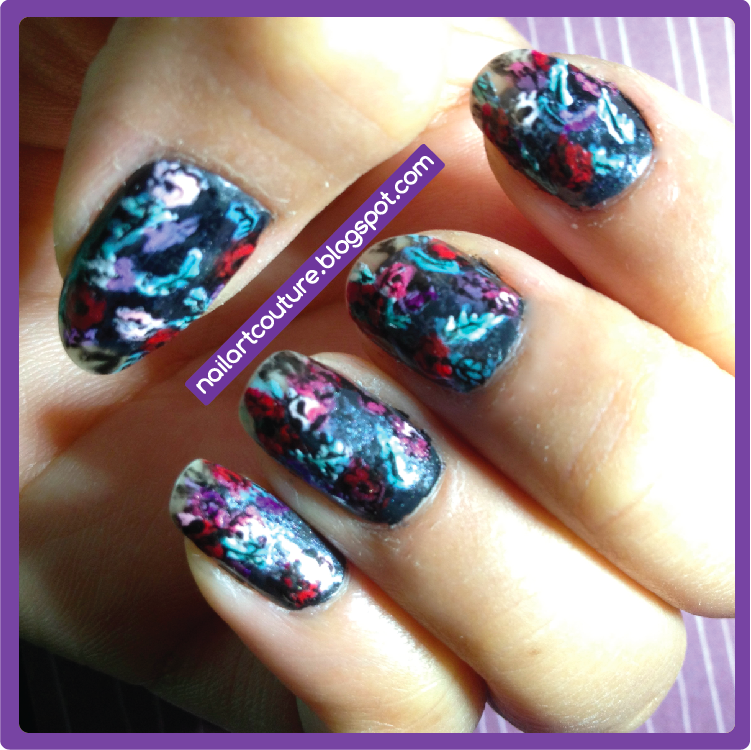 This post will be a combination of Julep Maven October Sneak Peek and what I received in my September packages. Anyways, I love 20ths of every month. My birthday happens to fall on a 20th. For more obvious reason, the reason why I love the 20th is because it's Julep Maven sneak peek day! Honestly, like every other Mavens, I was hoping that they would reveal a suede collection but instead it's crackle collection. 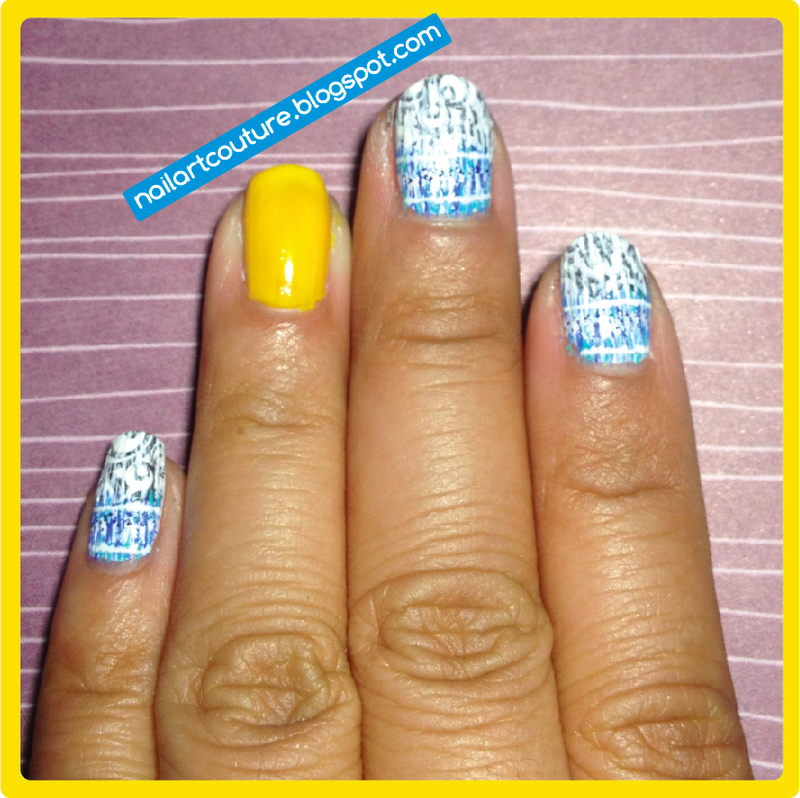 I am not a fan of crackle. The first time I was exposed to a "Shattering" polish was way before when OPI came up with it. I didn't like it then, I tried to follow the brief fad, but now I know I don't like it. So it was kind of disappointing when this new collection was available to us. I read a good point made by a subscriber, since Julep made their suede polishes exclusively for Sephora, it would make sense that they wait before releasing the collection through their Maven program. Otherwise, people would flock to Julep and pay a minimal price for 2 or 3 polishes compared to the $14 per bottle sold at Sephora. Anyways, this is the first time I've been disappointed with a preview and I'm sure I'm not the only one that feels this way. But it gets better, check out the new styles and what Julep has done for us to keep their Mavens happy! 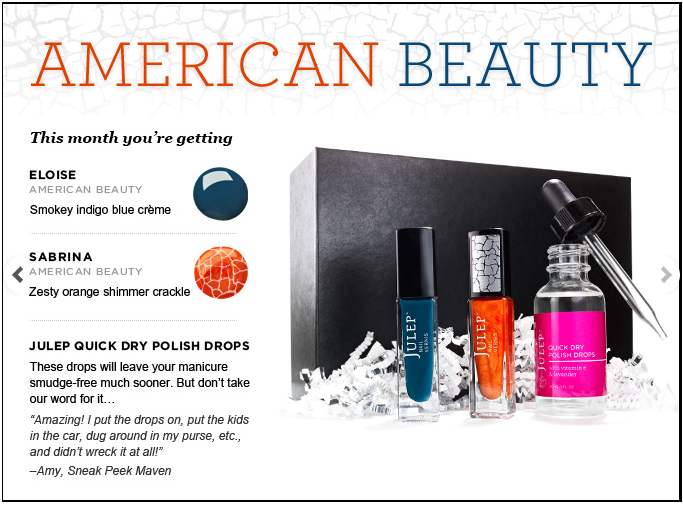 In the month of October, the featured product is their Quick Dry Polish drop (Value $14) to help protect your manicure. 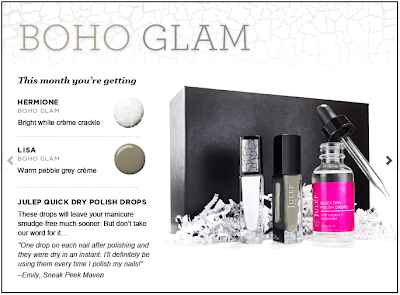 I am actually interested in checking out this polish drop. You would think a top coat would do the job, but we will see how this compares next month! Since Halloween is in the month of October, all the crackle polishes are names of famous witches, like Hermione from Harry Potter, Sabrina from Sabrina the Teenage Witch, and Ursula from Little Mermaid. I speculate that Glenda is the witch from Wizard of Oz, but her name is "Glinda", so I'm not too sure. As many of you know Toronto is hosting their own International Film Festival, also known as TIFF. Being a resident of downtown Toronto, I have been fortunate enough to drop by some red carpet events to catch a glimpse of the stars! I've lived in Toronto for 5 years and I can't believe this is my first time taking advantage of TIFF. I think it's just bad timing that I never got to go. But anyways, this year I tried to make the most out of it. The very first night, my friend and coworker Amanda went with me to go see the red carpet for On the Road. That premiere marked the first public appearance of Kristen Stewart since her cheating scandal. She also came with her co-stars Kirsten Dunst (Hello Bring it on!) and Garrett Hedlund (Tron Hottie). I am personally not a huge fan of Kristen Stewart, but I can't deny that she is absolutely beautiful. She came to the premiere with a stunning Zuhair Murad dress and I knew right away that I wanted to try and recreate that onto my nail. This Zuhair Murad dress is from their Fall 2012 Collection. I am completely in love with that dress, but obviously I could never pull it off as well as Kristen Stewart. Wow, it's been forever since I wrote about Loose Button Luxe box! Back in June, they decided to switch their monthly membership to seasonal. With the new membership, subscribers receive 4 luxe box a year. Back when it was monthly, many members including myself were disappointed that the quality of their products were going downhill. With this switch, I believe they have more time to scout out better brands to partner with and provide us with even better quality samples. This Fall Luxe Box is their inaugural seasonal box and I must say that I am quite happy with the products that I received. The first thing I noticed was the packaging of course! This is the third Loose Button box design and I definitely prefer this one a lot more. It is an amazing quality box, sturdy like Glossybox and definitely reusable. I think the white box makes it look very high-end. 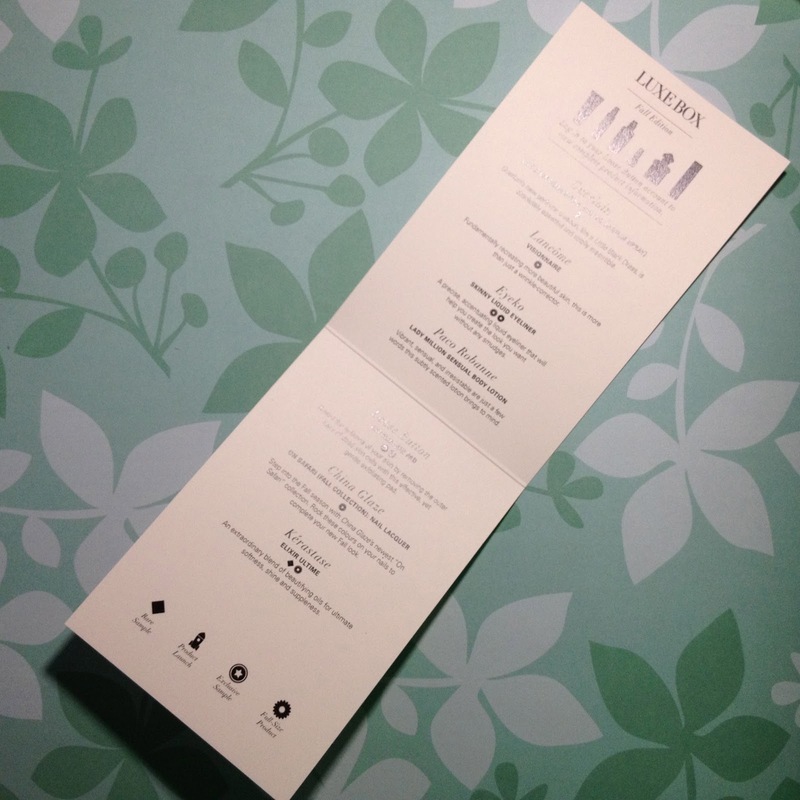 Their product card is very minimalistic, which again, adds to the high-end look. However, it doesn't have the pricing, which is a little annoying because I like to calculate the monetary value of the box. Also, the descriptions are short and succinct, which isn't necessarily a bad thing. I like things a little more detailed, but that's just me. Instead of crinkle paper, the products were wrapped in a beautiful white cloth. Finally, all the inserts were stored in a white envelope with a personalized gold sticker. All in all, in terms of packaging, this box definitely looks more elegant than their predecessors. Summer is slowly coming to an end. For the students out there, are you ready to get back to school? And for the adults, ready to get back to the old grind? Despite the gazillion school projects and essays, I honestly miss school so much! I think I miss seeing friends every single day. For all you students, honestly make the most out of your school experience! I am so excited to announce that my blog reached a pretty awesome milestone, 100,000 page views! Thank you so much for your readership! I know I don't post on a consistent basis, but I will try my hardest to fit more nail art in this month. 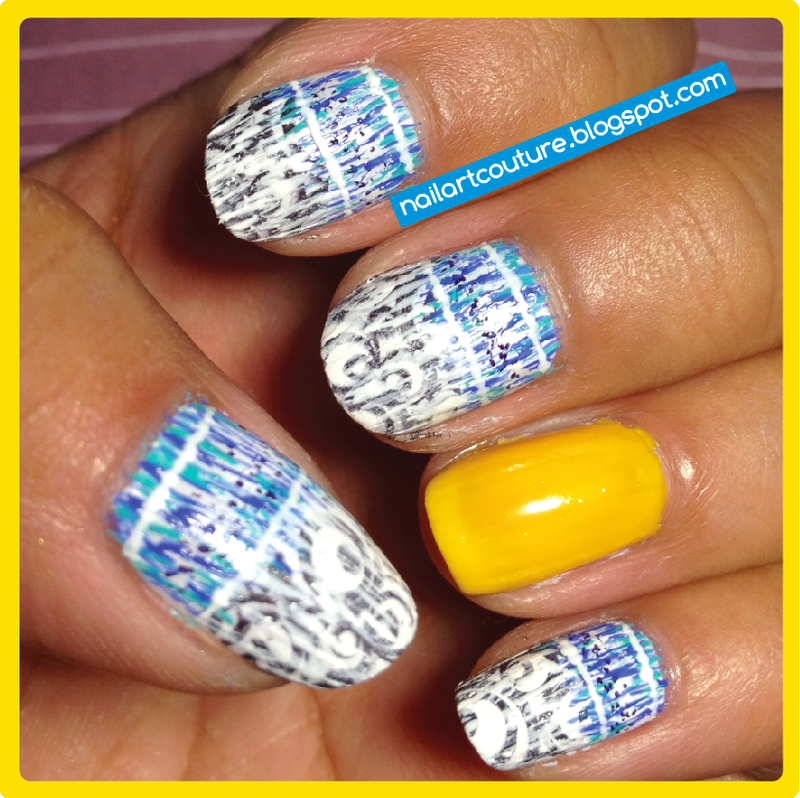 Today, I bring you another fashion inspired nail art, a Peter Pilotto Resort outfit from the 2011 collection. 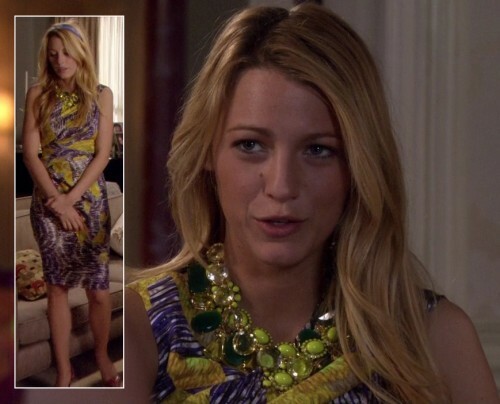 A dress that Serena Van der Woodsen wore on Season 5 Episode 23 "The Fugitives" was also in the same collection. But that dress is much more complicated to replicate. See what I mean? Nonetheless, this design is pretty fun and bright. I approached the design the same was as I did with the Marchesa Ombre Fringed design that I did a long time ago. They have a similar "fringe" look despite this outfit not being fringed. Want to see how I created this design? Keep reading!